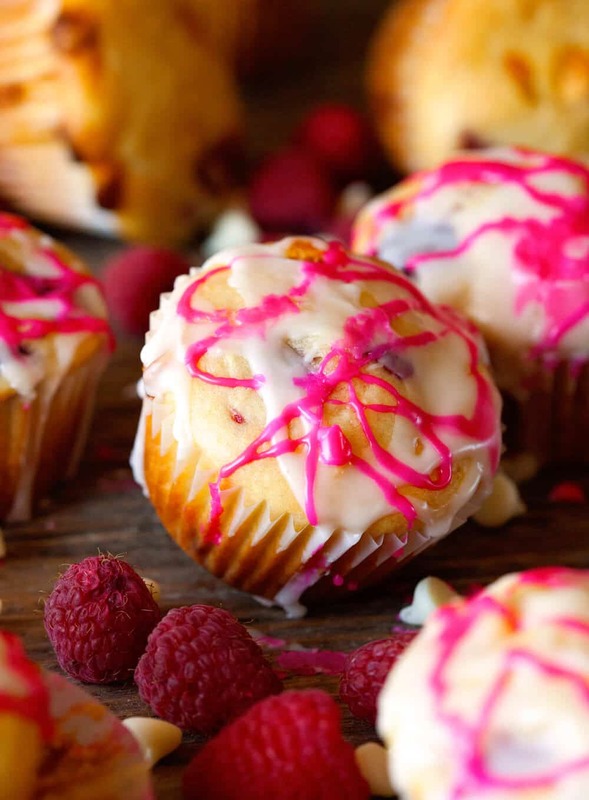 White Chocolate Chip Raspberry Muffins – Scrumptious Homemade Muffins studded with White Chocolate Chips, Juicy Raspberries and finished with a Sweet Glaze. Hello again! I am back to talk to you all about one of my obsessions. Also known as muffins. I have baked countless of batches of muffins, ranging all the way from classic flavors, to fabulous combinations, and anything in between. Or so I thought. Whenever I think I’ve made and eaten it all, another version of my beloved morning treats pops into my head and I can hardly turn on my mixer fast enough, ha. Today’s recipe was no exception. Since I’ve developed a huge love for fresh or frozen fruit, especially berries, in my baked goods and desserts, I was beyond thrilled when I was whipping up these muffins. Anything that contains chocolate has got to be good, right? But just wait until you add the frozen berries to the mix. They give the batter and eventually the muffins themselves those beautiful pops of color that will have everyone excited when they grab one. Aside from the fact that these muffins are esthetically pleasing, I was mostly looking forward to taking that first bite though. There’s nothing like sinking your teeth into freshly baked muffins and feeling the slightly warm yet juicy raspberries explode. The white chocolate is subtle, but pairs so well with the raspberries. I know I will be making this combo over and over again. I actually know the perfect day to make them again. With Mother’s Day right around the corner, I may have unknowingly created a muffin recipe that would be just the right thing to share with our moms. I can also think of so many other occasions to which I’d bring these. Baby showers, bridal showers, picnics or to a relaxing cookout with friends. Since they’re so quick to make, require pantry staples and are sure to please everyone, I don’t think one can go wrong. 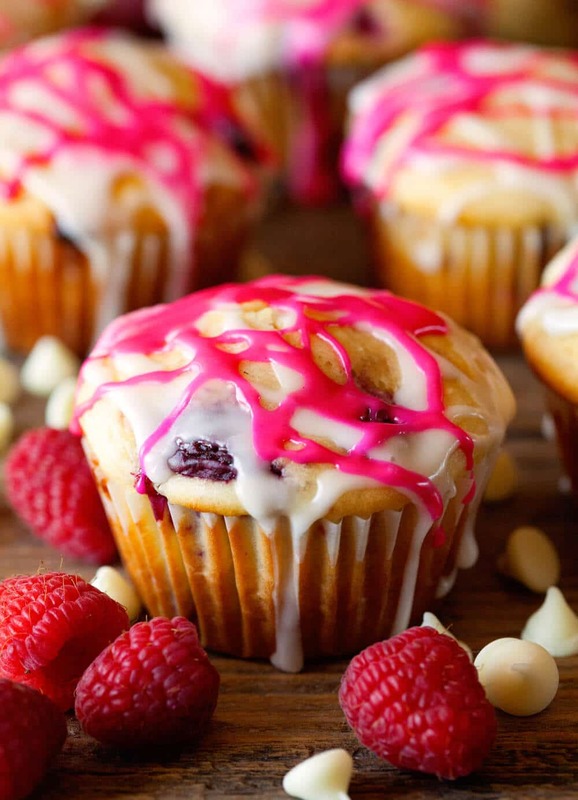 White Chocolate Chip Raspberry Muffins - Scrumptious Homemade Muffins studded with White Chocolate Chips, Juicy Raspberries and finished with a Sweet Glaze. Preheat oven to 375 degrees F. Grease a muffin pan with shortening or line with paper liners. Whisk together flour, salt, sugar and baking powder. Set the bowl aside. In the bowl of your stand mixer, mix together the eggs, milk, vanilla and oil until combined. Add flour mixture until just combined. Don't over mix. Fold in the chocolate chips and frozen raspberries. Fill each muffin tin about 3/4 full. Bake muffins for 22-25 minutes or until golden. Remove the muffin pan from the oven and place on a cooling rack. Let the muffins cool for 5 minutes before inverting the muffins onto the cooling rack to cool more. Once muffins are still slightly warm, prepare the glaze. Whisk together sugar and milk until smooth. I drizzled about half of the glaze over the muffins and added 1 drop of pink food coloring to the remaining glaze and mixed it well. 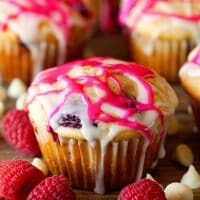 Drizzle pink glaze over the muffins as well. Let sit for 5-10 more minutes or until glaze is set. Enjoy! Things You Might Need to Make This Recipe! Such a beautiful color glaze! Talk about delicious looking muffins! These look amazing, Kathi and Julie. Now I want one for an afternoon snack! Well you can’t beat chocolate and raspberry as a winning combo in my book of life. I love muffins. Fun to have for breakfast and to take to work. Bringing homemade ones make you a very popular person. 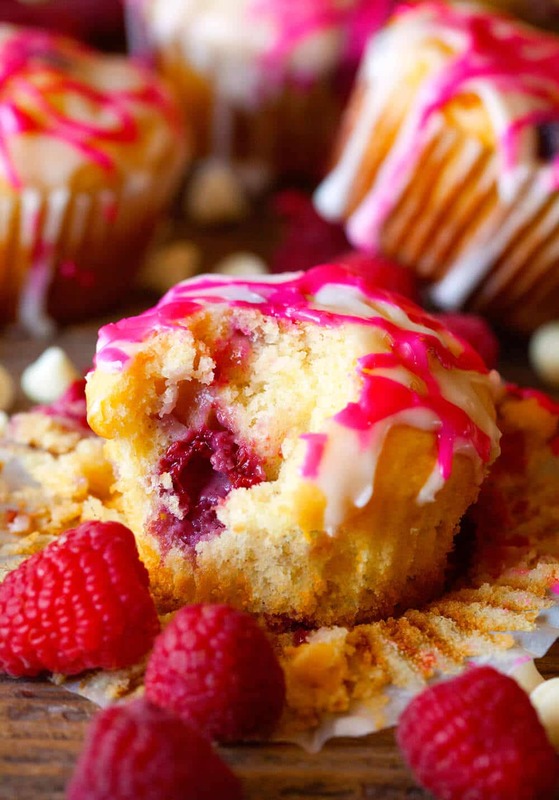 Kathi, not only do these muffins sound DELICIOUS, your photos are stunning! I mean, TOTALLY AMAZING. Love this recipe! These muffins are making me hungry. I love berry baked goods and this looks mouth watering! I too am also obsessed with muffins! These are so pretty! Perfect for a bridal or baby shower!